Put all your favorite reading materials and novels on full display with the Huron Grey and Cream One Drawer Bookcase. This traditional bookcase showcases a grey and cream color tone that will effortlessly blend into your home office, living room or bedroom. Just the right size, this piece has two open shelves plus an upper storage drawer for you to hide away any knick knacks. The fluted columns, curved facade, and embossed floral medallions make this bookcase an alluring and captivating furnishing to complete your space. 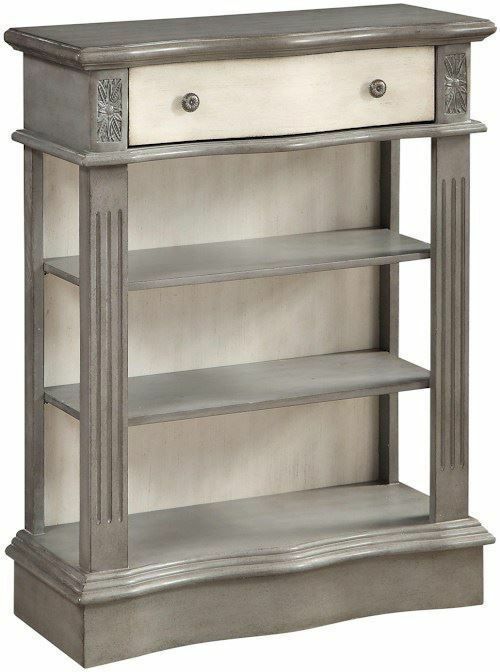 Put all your favorite reading materials and novels on full display with the Huron Grey and Cream One Drawer Bookcase. This traditional bookcase showcases a grey and cream color tone that will effortlessly blend into your home office, living room or bedroom.